Val Tovanella: a Patch of Real Wilderness in Blissful Solitude. The Val Tovanella Nature Reserve occupies an area of 1,040 hectares in the central part of the province of Belluno and in the southernmost fringes of Cadore. It evokes a sense of complete, solitary wilderness. The Nature Reserve is situated mostly in the municipality of Ospitale di Cadore, along the section of the Piave valley known as 'Canal del Piave' for its being very narrow; the villages in this area are mostly built in stone, with very tall houses (the picture below portrays Termine di Cadore – the first village of Cadore – from which the Val Tovanella Nature Reserve can be best accessed). The Val Tovanella is famous for the beauty of its forests, as its steep slopes – up to 1,700 metres of altitude – are covered by woodlands dominated by beech (Fagus sylvatica), mixed with Silver fir (Abies alba) at the lower altitudes and Norway spruce (Picea abies) higher up. At highest altitudes there are pioneer formations dominated by larch (Larix decidua), while the dry, rocky sites at lower levels are colonized by Austrian Black pine (Pinus nigra) and Scots' pine (Pinus sylvestris). In the dampest locations one can find also broadleaved species such as Maple, Ash, Mountain Elm and Lime (Linden). Much of the woodland had been felled in the past, especially during World War II, and on the upland plateaus one can still find the clearings that were once used for animal grazing. Now, the return of woodland is recreating semi-natural conditions, while at the same time there is a tendency towards the re-growth of shrubs in the clearings. Tree formations above 1,800 metres are dominated by Dwarf Mountain pine (Pinus mugo) and Hairy Alpenrose (Rhododendron hirsutum), which are accompanied by other Alpine herbaceous species. This is the last band of tree vegetation before the meadows and scree, which take over at the highest altitudes. The climate is cold-temperate, with precipitations that are particularly abundant in spring and autumn. The morphology of the lansdcape is characterized by a typical moulding with very steep slopes, only interrupted in the central section by small flat areas which were once used mainly for grazing. In the highest reaches, the lansdcape is dominated by scree, rock walls, pinnacles and needles, while the Dolomite summits of the Cime di Bosconero (2,468 m) encircle the valley head. The Val Tovanella presents itself as a wilderness area, not much frequented by walkers as it is not very easy to access – because of its orographic conformation – but of great naturalistic and scientific interest, both for its woodland habitats and for the flora and fauna it hosts. For this reason, wild fauna also finds suitable habitats inside the reserve. The presence of ungulates is quite abundant, represented mostly by Deer and Roe-deer, but undoubtedly it is Bear that represents the animal symbol of the Val Tovanella. The plantigrade was spotted for the first time in 1995 on Col Pelòs – and this was the first exceptional sighting of this species in the whole province of Belluno: at least since, many decades earlier, Bear had disappeared from this territory. 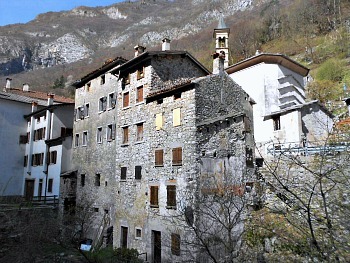 A complicated series of events characterized the history of the territory now covered by the Val Tovanella Nature Reserve, since across this area a boundary ran for centuries, dividing different parts of what is today the province of Belluno (Cadore, Zoldano and the so-called 'Bellunese'). Several owners succeeded over time until 1968, when the Val Tovanella Nature Reserve was finally acquired by the State, with the original intent of creating a National Park that never came to life. The Corpo Forestale dello Stato (Italian Forestry Commission) is now in charge of managing the reserve. As a note of curiosity, within the Val Tovanella are visible sections of a Roman road, and it could be added that in 1535 the Venetian painter Jacopo Sansovino was charged with the task of drawing a map of the area, on indications coming from the Titian (the great Renaissance painter from Pieve di Cadore). In the less steep parts of the reserve man has cleared in the past small patches of meadow used as pastures, building the traditional 'casere' in stone alongside. The best conditions for livestock farming and animal grazing were on the pastures at the northernmost and southernmost end of the valley, in the areas known as Col Fasòn and Pescol, and the so-called Costone di Tartara. Today these areas, abandoned a long time ago, have almost entirely been reclaimed by forest. The main vocation of the Val Tovanella, for a long time, has been timber production; the steepness of this territory has not prevented, in the past, its lush wood cover of beech (Fagus sylvatica), mixed with Silver fir (Abies alba) at lower altitudes and Norway spruce higher up, from being subjected to harsh cuts – especially at times when this resource was most needed (until the end of World War II). Along the streambeds one can still find the traces of the temporary artificial dams that were created for regulating the hydraulic transportation of cut timber; almost everywhere one can also notice abandoned metallic wires and the poles supporting the old, disused zip-wires. The once intensive exploitation of the area can still be appreciated in the presence of numerous charcoal kilns too. Today, with the cessation of any form of cutting, the abandonment of the old trails' network and of farming and grazing practices, the woodlands have been returned to a condition of almost total naturality. This area has always been rich in woodland, and cut wood – until the mid-19th century – was floated along the stream to the Piave, but sometimes, in order to make transportation easier, the wood was transformed into charcoal in situ, with a procedure that lasted several days; in fact, after many years, the remains of charcoal kilns are still visible to this day. Another traditional activity that used to be carried out in the area is the collection of Heather (Erica carnea), mainly done by women. This plant was employed to create brooms, then sold mainly to traders from Vittorio Veneto, who needed them for their silkworm plantations. It is also worth mentioning that inside the reserve – at the time of the inventory of monumental trees within the province carried out in 1984 – was found a specimen of Taxus baccata (Common yew) about 15 metres tall, with a girth of 3.5 metres and an estimated age of 400/500 years. This specimen is still in good conditions today, but not very easy to find! The Val Tovanella lies on an area of passage between the strictly Dolomite district and the Pre-Alps. Several rock formations appear here; the main, though, are two: Dolomia Principale (Main Dolomite) and Scaglia Rossa (Red Scale). The former is composed of layered Dolomite rocks, and forms the mountains of the upper valley; to this rock type are associated the craggy, typically ‘lunar’ landscapes of the Dolomites. The latter type of rock, on the contrary – as the name suggests – is of a distinctive reddish color, and made up mainly of clays and limestone. Being more prone to erosion and degradation, it tends to form softer, more undulated shapes with rounded outlines. Included within the beautiful Dolomite chain of Bosconero (2,468 m), the Val Tovanella is itself a morphologically rough and severe side valley cutting through a series of stratified sedimentary rocks, dislocated and overlapped by large over-thrusts. Only along the southern limits of the reserve does the landscape become softer with small plateaus, formed by the more tender Scaglia Rossa. The Tovanella gorge – which is a hung valley – is an ancient relic from the glacial era. The state of knowledge on the flora of the Val Tovanella is not very good. This is due mainly to the forested nature of the area and its location at the margins of the Dolomites, which make it poorly accessible. Having said that, within the reserve there is the ascertained presence of about 680 plant species. Initial investigations have allowed to discover important sites already; on the rock walls, for example, is the rare endemic species Moehringia glaucovirens, a casmophite (plant growing on rocks) with a disjointed distribution which finds here its southernmost and easternmost location within the Dolomites. This plant is classified as ‘endangered’ together with Hymenolobus pauciflorus, which grows in chamois dung on rock ledges. Besides the confirmed presence of Campanula morettiana and Physoplexis comosa – which are relatively common species in the Dolomites – the endemic species Spiraea decumbens ssp. tomentosa is also recorded. Also, the complete absence of wood cuttings and of human disturbances for the last forty or so years has created a condition of absolute privilege, which could reveal data of extraordinary scientific value in the future – considering the process of re-naturalization which is underway. In fact, there are several areas that are almost inaccessible, and these guarantee highly un-spoilt conditions. Some peculiarities of the reserve include Rowan (Sorbus aucuparia) formations, which are interesting from a naturalistic point of view – as well as being a rare presence in the Veneto region. There is also a meadow habitat with Deschampsia caespitosa – a grass which can be interpreted as a symptom of degradation due to low grazing levels and/or the abandonment of cultivated land. Other notable species to be seen here include Asplenium seelosi (a fern) and the notable Campion Silene veselskyi. As for beech associations, these are the dominant forest types within the Val Tovanella. The typical high-mountain beech woodland can be recognized by the structural habit, developed by many specimens, of a ‘knee’ at their base, which indicates the weight of snow during winter months. Other beech formations used to be typically managed with coppicing, and are now slowly reconverting to mature woodland, sometimes mixed with sycamore; finally, there is also a beech formation with Norway spruce (Picea abies), which is a climax association, as beech represents here the terminal species in the altitudinal succession. The reduced presence of larch – or its absence – within the Val Tovanella also points at the high degree of naturality: larches, generally speaking, are a good indicator of the fact that in the past a certain area used to be grazed by animals. A particularly rare formation is the Sub-Mediterranean Black pine association: these trees cannot be found as one proceeds further inland into the Alpine chain, and they also find here their westernmost location (as these formations tend to be typical of the Illyrian mountains and the Balkans – and so more of an eastern European distribution). The mixed formations with Dwarf Mountain pine and Rhododendron that can be found in the Val Tovanella upper reaches are also to be distinguished in three different associations: Dwarf Mountain pine with beech, Laburnum anagyroides and Sorbus species; Dwarf Mountain pine growing on basophile subsoil – which is the main type, rich in grasses that occupy vast expanses – and, finally, Dwarf Mountain pine growing in association with larch and/or on rock faces. Within the context of this page, I have also thought of dealing with other similar environments as the Val Tovanella; these are all short side valleys branching off the main axis of the Piave valley, including the Val Montina, the Cajada Basin (Val Desedan) and the Val Gallina. I have also included here the Grisol valley, in the lower reaches of the Maé valley, as it presents a very similar environment. Nestled at the head of the small Desedan stream side-valley, the Cajada Basin lies within the easternmost fringes of the Dolomiti Bellunesi National Park, inland of the Piave valley just to the southwest of Longarone, but decidedly off the main route. The road that leads to Cajada is narrow but can be driven until the car park at Pian de le Stele, and in its upper section it is literally carved among dramatic rock ledges that fall sheer from above. Pian de le Stele is the locality from which most paths start, and several options open up from there. One can simply take a small or medium-length circular route within the basin itself, or embark on a more demanding traverse to the Valle dell’Ardo through Forcella Caneva (1,849 m) until the Rifugio 7° Alpini (mountain hut; 1,502 m). A further option is to climb up to Cajada directly from the Piave valley floor (consider Faé-Fortogna rail station as a handy starting point), following a mule track along the stony bed of the Desedan stream. The Cajada Basin is an atypical feature in that it was probably originated by an ancient landslide; now it is famous for the quality and extension of its forests and its diverse wooded habitats. As far as the origin of the basin is concerned, it is distinguished by a peculiar and enigmatic amphitheatre shape: the vast Cajada Basin lies as if suspended high on the small Desedan valley; it is crowned by a circle of peaks (Cimon, Cime di Cajada, Cirvoi) and enveloped at its base by a belt of wooded detritus’ slopes. On the wide, undulated valley bottom (created by glacial deposits and debris left by old streams) numerous small rivulets and minor water courses converge, which in part do dissolve because of karstic infiltration, only to reappear again further down to originate the Desedan stream, while in part this water turns into marshland – as in the Palughet wetland. Pian Cajada ('Cajada plain') is a basin with a very complex morphogenesis: recent studies have set forth the hypothesis that its formation is to be framed within the context of an imposing historic landslide that detached itself from the Cime di Cajada during a phase of partial retirement of the ice sheets during the last glaciations (25-30.000 m.y.a. ), which filled and obstructed completely what is today the Desedan valley head. After that, during the last glacial expansion, the surface of the landslide was softened in its morphologic traits by a ‘tongue’ of the huge Piave glacier that inserted itself sideways. The gigantic landslide accumulation that was formed as a result, and which constitutes the substrate of the basin, is stabilized by now – apart from its eastern side, which is still affected by extensive erosive phenomena. This massive landslide is clearly visible on the left along the road that climbs up to Cajada, while its upper edge can be skirted with a path. The circle of mountains that encloses the Cajada Basin is mostly sculpted in the flint Dolomite belonging to the Soverzene Formation, but when walking up to Casera Cirvoi one will be presented with the rocky marls of the Igne Formation as well, and then – in sequence – with the tenacious banks of the Vajont Limestone, often minutely sculpted by karstic phenomena such as Karrenfelds and dolines; glacial deposits are also scattered on the basin bottom. As anticipated before, among the noteworthy biotopes of natural interest within the park, the Cajada Basin stands out for the quality and extension of its forests: its wooded habitats include a valuable Silver fir/beech mixed formation (the climax association here), interspersed with softly undulated clearings and a wide, open marshy depression that is still being used by grazing animals (the so-called Palughet wetlands). Among the other noteworthy features of the Dolomiti Bellunesi National Park, the Val del Grisol (Grisol valley) is distinguished by the peculiarity of its humid, fresh and shady canyon environment and for the quality of its mixed Silver fir and beech woodland (as said already, this is the climax association in the area). A secluded side valley, the Val del Grisol was originated by the confluence of a network of small streams that score and drain the eastern slopes of the Schiara-Talvena group (Val dei Ross, Costa dei Nass, Grave di San Marco). It is a solitary side valley, carved in a substrate of marine Jurassic sedimentary rocks belonging to the Soverzene Formation (flint Dolomite), the Igne Formation (marl and limestone) and the Vajont Limestone (a compact type of limestone stratified in layers). Steep slopes and high rock ledges characterize the areas that surface in the compact, tenacious formations of the Vajont Limestone – overlooking the settlements of Grisol de Fora and Grisol de Entro – and of the Soverzene Formation (canyons and rocky valley floor environments); only on the marly, more degradable substrates of the Igne Formation can one find small flat areas. One can access the Val del Grisol through a small country lane that enters from Soffranco (in the lower Maé valley), running half-way along the slope and deeply cut into the flinty Dolomite of the Soverzene Formation; the road then skirts the isolated hamlets of Grisol de Fora and Grisol de Entro. Once reached the innermost section of the valley, the road goes past two small bridges (the stream here cuts deep into layers of flint Dolomite) and then continues on the opposite side, reaching eventually the small moraine plateaus of Fagarei and Rizapol; this section is molded in the soft, more degradable rocks of the Igne Formation, and it is not infrequent to find – among the marl fragments that often slide down on to the road – some Ammonite fossil. Just before the Fagarei area, an ancient landslide has caused the obvious deviation of the Grisol stream, forcing it to open a new passage by cutting a very narrow and deep canyon, thus creating a curious meander-like shape.